This is roughly 2-hour ‘free’ session where all interested folks (and maybe students from the nearby music college?, etc) can gather to play music or listen to musician’s learn how to play and interpret mostly rhythmic tango music (from various orchestras of the Golden Age). To this end, there is a Tango Jam Book (10MB, 31 page PDF file for download) with lead sheets for several classic tango/vals/milonga songs with notes, counter melodies, lyrics for singers, and other resource info. 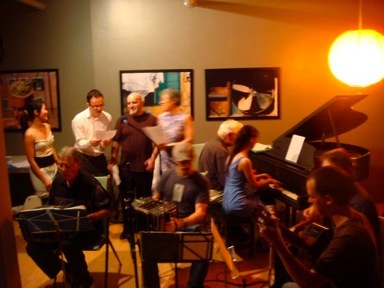 Musicians who are new to tango or more experienced ones can bring their instruments and we can all play together. What is required is a decent sized space to fit all interested musicians/spectators with perhaps a piano or portable keyboard (plenty of chairs that can be moved around to form the proper environment would be idea).